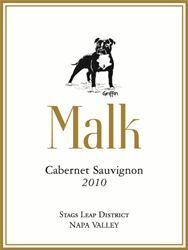 The inspiration behind the Malk Family Vineyards logo was their beloved Staffordshire Bull Terrier, Griffin, who recently passed away at the age of 15 1/2. The complex layers of his personality displayed a bold yet colorful character, which exemplify the attributes of the wine his portrait graces. Brian and Nancy intend to uphold his honor with every vintage.